Undergraduate and graduate engineering students learn the value of teaching in a Viterbi School community outreach program. December 09, 2008 —How do you explain the workings of a generator to a 10-year-old? You identify the big ideas (magnetism, electrons, electricity and change in electric field), use simulations and videos to explain the concept, have the students build their own generator, and then get students to analyze their learning. In the process, you’ve just learned to teach! Sinchai Tsao, a doctoral candidate in the Biomedical Engineering Department, shows students MRI images of the brain and other parts of the human body. Welcome to “Engineers as Teachers.” The course is organized and supported by a non-profit, Iridescent, and by three Viterbi School engineering departments: Aerospace and Mechanical (AME), Biomedical Engineering (BME) and the Epstein Department of Industrial and Systems Engineering (ISE). Undergraduates from these departments sign up for three technical elective units and go through a 13-week training program. 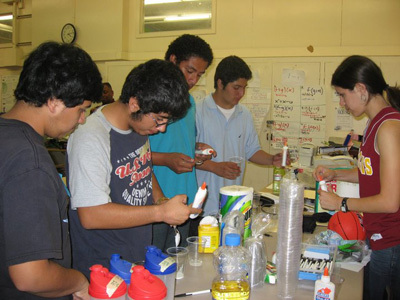 The goal of the program is to inspire inner-city children to strive to be scientists and engineers. In return engineers learn how to communicate complex ideas to large, diverse audiences. “These are very valuable skills if you want to have a powerful career in any field,” says Tara Chklovski, president and CEO of Iridescent. Course topics developed this semester ranged all the way from the physics of MRI (magnetic resonance imaging) to animal locomotion. Sinchai Tsao, a Viterbi School doctoral candidate in BME who is concentrating on medical imaging under adviser Manbir Singh, a PhD researcher, has been co-teaching the MRI course. The course was held at College Ready Academic High School, an inner city charter school at the corner of S. Western Ave. and Martin Luther King Blvd. 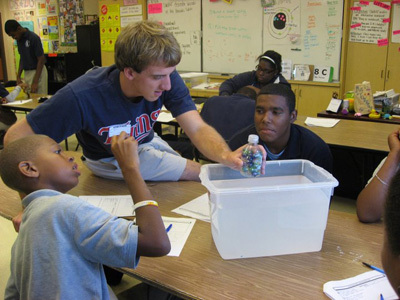 Ben Vatterott, a senior AME student, demonstrates buoyancy in a lesson on the physics of sailing. “My students helped me question my own intuition about key concepts that I took for granted. They also challenged me to express complex concepts in an intuitive and logical manner, which are all key skills that are central in my training as a PhD,” says Tsao. 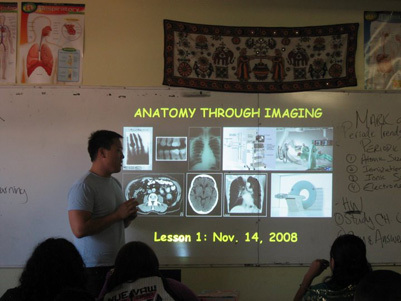 In addition to lesson plans and curricula, Tsao and Hu also helped design some unique instructional materials, such as science posters and T-shirts, to help students remain excited about science and be proud of their learning. Guru Sundar, biomedical “senator” in the Viterbi School Graduate Student Association, just joined Iridescent this past semester. He taught a single session on cardiovascular mechanics at Palms Elementary with two USC BME graduate students, Heidi Gensler and Man Nguyen. “Iridescent has a dual purpose that may not be immediately apparent,” says Sundar. “In addition to serving the children, Iridescent provides a way for senior undergraduate and graduate engineers to develop and refine their communication skills. It is a double-edge sword that I see great potential in. The fourth grade children at Palms were instantly captivated by our lesson on how the heart works. It was rewarding to observe them enjoy their learning. Three Viterbi women engineers inspired the young students to believe that women can be engineers. When asked to draw a picture of an engineer, 75 percent of the students drew pictures of girls in the role. Emily Hedges, Kimberly Popp and Robyn Strumpf – all “Engineers as Teachers” alumni — came back this semester to conduct three separate Family Science Courses at Trinity St. Elementary, Shenandoah St. Elementary and Foshay Learning Center. The topics were animal locomotion and sports science. The courses were funded by American Association of University Women and USC’s University Neighborhood Outreach (UNO) program. Robyn Strumpf, right, a mechanical engineering, political science and engineering management major, brings materials science to sports by teaching students about rubber polymers and what makes rubber bouncy. Hedges and Popp taught participants about drag, thrust, viscosity and buoyancy with the aim of showing them how different animals adapted to move in different environments. Strumpf taught participants about why different sports equipment is made out of particular materials. For instance, participants learned about the materials used to make baseball bats by measuring the deflection properties of wood, aluminum and steel. They also learned about why some materials are appropriate for basketballs and others for tennis balls by making their own bouncy balls according to Chklovski. Participant learning and change in interest was measured through pre-and-post-test and Exit Slips — three questions that tested understanding of the concept — at the end of each session. Courses conducted by current students Daniel Orr, Nathan Heussenstamm, Kelly Phillips, Loni Iverson, Ben Vatterott and Torey Raphael focused on renewable energy, optics and the physics of sailing. Students designed five lessons, complete with pre-and-post assessments, exit slips and hands-on activities. They practiced explaining the concepts during training and then taught the courses in sixth, seventh and eighth grade classes at View Park Preparatory School, a charter school that is part of the Inner City Educational Foundation. “Engineers as Teachers” is rapidly growing to be a powerful movement, Chklovski reported. ← For those in Neuroscience, Here’s an awesome list of journals!